UN-Habitat Sri Lanka | UN-Habitat and the Government of Japan Provide Support Towards Improving the Learning Environment in Mannar, Sri Lanka. 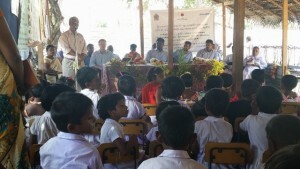 UN-Habitat Sri Lanka > News > Learning Environment in Mannar News > UN-Habitat and the Government of Japan Provide Support Towards Improving the Learning Environment in Mannar, Sri Lanka. district today to officially commence construction activities for new school buildings and WASH facilities through the project “Sustainable Resettlement through Community-Driven Improvement of the Learning Environment in Mannar District, Sri Lanka”. Funded by the Government of Japan, this project is valued at $4.2 million and is implemented by UN-Habitat in collaboration with the Ministry of Education, Provincial Ministry of Education in the Northern Council, Zonal Education Offices in Mannar and Madhu and other stakeholders. 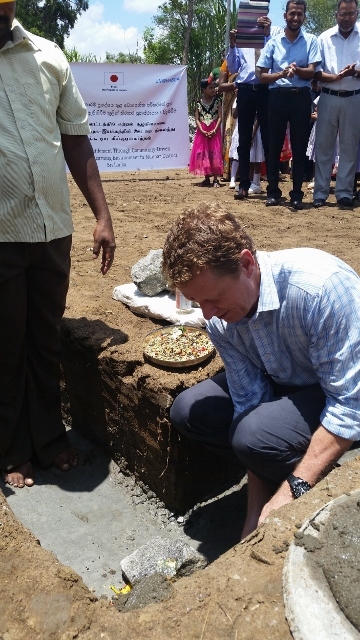 Foundation stones were laid for new school buildings in two of the schools being assisted by the project, namely the Mannar/Ikra Government Muslim Mixed School in Musali DS Division and the Mannar/Periapandivirichan Primary School in Madhu DS Division. Both schools have been selected for assistance by the project as they lack resources and facilities for the school children and teachers. At present, the Ikra Primary School is functioning in a community centre with minimal facilities. Lessons are held under trees and in the school hall. The Periapandivirichan Primary School, with 127 school children, is functioning in a temporary shelter constructed with a woven cadjan roof, without adequate space or proper educational facilities. In order to improve the learning environment of the schools, a school building including an auditorium, canteen with kitchen and storeroom, and water and sanitation facilities will be constructed for each school. The ground breaking ceremonies at the two schools were organized by the School Development Committees. Following the events, several trees were planted in the school premises. Mrs Sebastian, the Zonal Director of Education, Mannar, Mr John Quintus, Zonal Director of Education and Mr Rohan Croos, Assistant Director of Planning, Madhu, Mr Tim McNair, Chief Technical Advisor and Mr I A Hameed, National Project Manager of UN-Habitat participated in the events. Senior officials from the Divisional Secretariats, religious leaders, Grama Niladhari Officers, members of Community Based Organizations and School Development Committees, school principals and teachers, school children and their parents also participated. UN-Habitat in partnership with community based organizations, Parents and Teachers Associations and central and local Government authorities.